Type 1 diabetes put Nich in a hospital bed for nearly a month. He recovered and discovered football, which required heavy lifting. See why this teen refuses to take 'no' for an answer! I was diagnosed with Type 1 diabetes on July 23, 2008. I was released from the hospital after one month's stay, at 6'0" 104 pounds, bone dry. The disease I was diagnosed with was so foreign that it was incredibly mind blowing that I was diagnosed with it. I had no idea what it meant, but before I was diagnosed I weighed in at about 140. 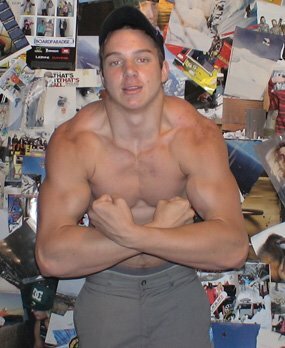 I was a skinny-fat, mid-teen who knew nothing about lifting. I began lifting in November of 2010 on my 16th birthday. My mom got me my first gym pass in August, but I never used it. In November, I began lifting and was inconsistent, with poor training, dieting, and sleep. Being a gamer, I spent countless hours a day on my computer doing mindless crap, wasting my days away. I changed schools in 2010. At my previous school, there was no football team, so when I came to my new school, I became very interested. I began playing football, and two years later I went and played at the Provincial All-Star Senior Bowl where I got a lot of notice for my football career. I decided I wanted to stick to lifting and put all my energy and focus into lifting for aesthetics and bodybuilding. Staying fit and healthy is a goal of mine for life. Nich stiff-armed diabetes on his way to the gridiron. Motivation is key. You don't make "mad gains" overnight. Most people and friends in my experience quit lifting after a few months, because they're not seeing the results, but I understand why. Either, they train half-assed, never breaking a sweat, begging the spotter to let them put the weight down, or they don't understand the art of bodybuilding. I get motivation from bodybuilders such as Arnold Schwarzenegger, Ronnie Coleman, Lou Ferrigno, Franco Columbu, Kai Greene, and Zyzz (yes, I am a fan of the aesthetic lifters as well). I also am very into music, I like anything from death metal, to hip hop, to progressive house and dubstep. The key is motivation, surround yourself in it; engulf yourself in things that will keep you motivated. Friends, magazines, movies, and a good workout partner! Hit your macros AND micros! If you are living with a chronic disease, or any type of disease that you think will put you back, get over it, as harsh as it sounds. Anything is doable; you just have to have the right mindset! You can do it! No matter what it is, there is a way! Rick Hansen did it, I AM DOING IT, and you can too!